Singapore-based interior design firm Distillery Studio has completed a top-to-toe renovation of The Club. 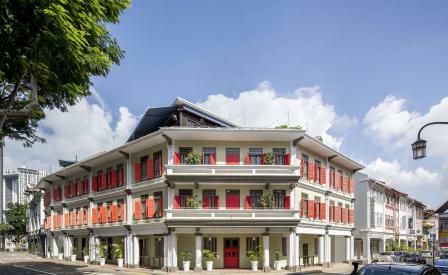 Set in a row of grand, perfectly preserved, early 20th- century shophouses in Singapore’s buzzy Chinatown quarter, the 20-room hotel has traded in its previous stark black and white palette in favour of a mood that is visually softer and more tactile. De Gournay wallpaper hangs in the lobby, framed by customised marble, while the guest rooms and public spaces are swathed in woven vinyl flooring, vintage furniture, and wainscoting in muted tones. Under-utilised spaces have been reimagined into a bijou bar and lounge, and a former retail space is now home to The Disgruntled Chef restaurant. Meanwhile, an abandoned courtyard has been converted into a quiet nook for tete a tetes, though for our money, the prime seats are still on the rooftop for the views of skyscrapers of downtown Singapore.